Weekends give us a chance to play and rest. And we all deserve more time to rest. However, weekends can fly right by when you waste too much time on activities that don't provide any real return. I love Netflix as much as the next person, but spending all weekend on binge-mode can leave you feeling guilty on Sunday night. A truly great weekend is about balance. You need to spend some time on yourself, to relax. Some time with people, to connect. And spend some time on your life, to improve it. 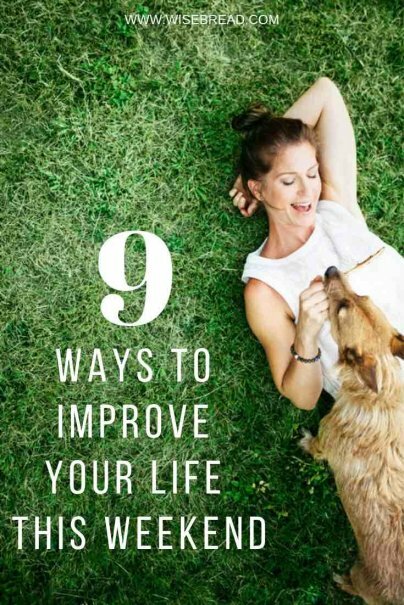 Here are nine ways to easily improve your life this weekend. Pick one room, closet, or cluttered spot. How much time do you have? If it's less than an hour, go through the junk drawer. If you have an entire morning, tackle the office or bedroom closet. Can you spend a day on it? Go for the garage. Valuable and large items: This would include furniture, appliances, electronics, jewelry, high-end clothing or accessories, and sports gear. Cheaper items and trinkets: This includes sets of smaller, less-valuable stuff like kitchen items, clothing, shoes, toys, craft supplies, books, and household decor. Life changes, you change, and your budget needs to change, too. Spend a couple hours going over your bank statements from the last three months. Compare your actual spending and bill-paying to what you have on your budget. When you find discrepancies — you're spending consistently more or less on an area than you have budgeted — it's time to adjust. The next step is to look for any money leaks. A money leak is something that takes money from you but doesn't give you anything in return. It might be a subscription or membership you no longer use, but never canceled. Or it might be the result of careless habits: lights left on, food spoiling, or late fees from not remembering to pay that bill on time. Locate those leaks and spend a little time plugging them up! There is a staggering amount of research showing that gratitude is a powerful way to improve your life. Over time, the practice of gratitude leads to a more optimistic outlook on life. How great would it be to see the challenges of life not as obstacles, but as opportunities? A gratitude journal can help with that. There are lots of little purchases that may seem unimportant in the moment, or even frivolous. But if you don't fix that broken headlight (for example), you could end up with a ticket. If you don't buy the train pass, you could end up spending a small fortune on taxis and Ubers. Find the one item that will eliminate the need for multiple small purchases, and that will make your life easier, and get it this weekend. Being outside is a no-cost way to improve your life. And it doesn't matter how busy your weekend is; even if you only have five minutes, you can use it to stand under a tree and breathe deep. It will improve your mood far more than checking your phone. If you have a little more time, take a walk. Doing so can boost your creativity and lower your blood pressure. As we rely more on technology for every aspect of our lives, it becomes more important to secure your data so no one else can get to it. Start by setting up a password manager (LastPass and 1Password are both great choices) and get your email, banking sites, and social media sites secured with randomly generated passwords and save them in your password manager. As you use other sites and apps, add them to your password manager. You can also save secure, encrypted notes in your password manager. That's the right place for, say, your bank account number, social security number, and other sensitive data. Quit saving it on your phone's Notes app or as a photo. Save it securely. Humans are social creatures, but sometimes we're not great at maintaining social connections. Despite our instant means of communication, sometimes we let old friendships slide away. But there's value in these relationships: they validate who we are and can bolster our self-esteem. So make a phone call, send an email, or arrange a lunch date with an old friend over the weekend. Your shared past can help you both improve your present.